Date: Saturday, 15 November Time: 14:30 GMT Venue: Twickenham Coverage: Live commentary on BBC Radio 5 live and full live text commentary online. Highlights on BBC Three at 19:00 GMT. 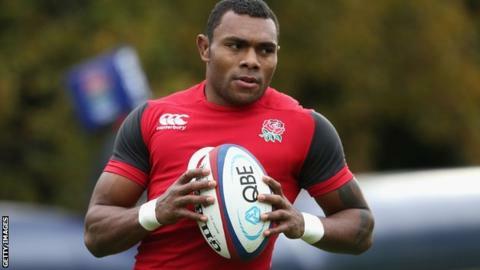 England winger Semesa Rokoduguni has been ruled out of the autumn international against South Africa on Saturday with a hip injury. Harlequins' Marland Yarde has been called up as a replacement. Serving soldier Rokoduguni, 27, made his debut against New Zealand on Saturday, but picked up an injury in the 24-21 defeat at Twickenham. Centre Kyle Eastmond returned to full training on Tuesday having recovered from an illness. Wasps back-row forward James Haskell has also been added to the 24-man squad as cover for blind-side flanker Tom Wood. England name their team on Thursday. Despite the defeat by the All Blacks, England attack coach Mike Catt suggested the bulk of the back-line will be given another opportunity to gel against the Springboks. "They looked very reassured in defence," he said. "If we play the way we can play, Kyle Eastmond will get more into the game and be able to create more things we know he is capable of creating." Catt believes it would be unfair to drop either 25-year-old Eastmond or outside-centre Brad Barritt, 28. "I think it would be very harsh to move those two players on," he said. "We've been very happy with Kyle. He's been in amazing form for his club." Another option England have is to select Bath fly-half George Ford and move Owen Farrell to inside centre, a combination that represented England at age-grade level. But, former England centre Jeremy Guscott told BBC Radio 5 live this idea "wouldn't work". "You put Farrell into inside centre, you lose your get-go and dynamic power to get over the gain-line from someone like [Luther] Burrell or [Billy] Twelvetrees, and Farrell is not as great a distributor as Kyle Eastmond," Guscott said. "So in no way will Farrell work playing at 12, that is a definite no-no. They played together at [England] Under-20 level, but this is man's rugby, this is Test rugby." Catt, though, says it could happen in the future. "It's an option," he said. "But we are very blessed with 12s and 13s at the moment so we will select what is best for the team and what is right for the team." England Squad: D Attwood (Bath), B Barritt (Saracens), K Brookes (Newcastle Falcons), M Brown, D Care (all Harlequins), C Clark, L Dickson (both Northampton Saints), K Eastmond (Bath), O Farrell (Saracens), G Ford (Bath), A Goode (Saracens), D Hartley (Northampton Saints), J Haskell (Wasps), J Joseph (Bath Rugby), G Kitchener (Leicester Tigers), G Kruis (Saracens), C Lawes (Northampton Saints), J Marler (Harlequins), J May, B Morgan (both Gloucester), M Mullan (Wasps), J Nowell (Exeter Chiefs), C Robshaw (Harlequins, captain), H Thomas (both Bath), B Twelvetrees (Gloucester), B Vunipola (Saracens), A Watson, R Webber (both Bath), R Wigglesworth (Saracens), D Wilson (Bath), T Wood (Northampton Saints), M Yarde (Harlequins), B Youngs (Leicester Tigers).